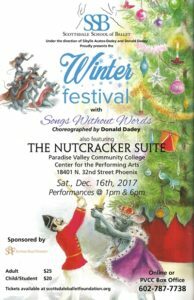 When: December 16th 2017 1:00 p.m. & 6:00 p.m.
Once again, with the “2017 Winter Festival”, sponsored by the Scottsdale Ballet Foundation, we present an original choreography, by director, Donald Dadey on the Advanced level students. These original choreographed ballets in past performances have featured, to great reviews, such wonderful works as “Exaltation of Angels”, “Solsitice”, “Precipice”, “Encanto” and “Water Dances”. This year Mr. Dadey will present “Songs Without Words” set to the piano pieces by Felix Mendelssohn. As always for the holiday treat of the evening we present “The Nutcracker Suite” where the directors, Sibylle Acatos-Dadey and Donald Dadey, present a 1st Act Party Scene, leading into an enchanting Snow Scene. Then on to the exciting and dreamy highlights from Act II. In this act you will see and be delighted by our interpretations of all of the traditional dances, culminating with the solo featuring the Sugar Plum Fairy and a rousing finale by the entire cast. Make this part of your Holiday tradition!